Legal NFL game betting is as old as the league itself, dating back to 1920 when the National Football League was founded. However, college football was far more popular and remained ahead of pro football in betting action for the next several decades. However, all that changed when the AFL-NFL merger became official in 1970, where both leagues agreed to become the two conferences and play under one league and keep the NFL name. Over the next decade or so, pro football would surpass college football and eventually dethrone pro baseball, becoming the most popular and bet on sport in the United States – a title it firmly holds to this day. It is our mission is to provide you with the best legal and secure online sportsbooks, so you can bet on NFL games and the Super Bowl without worrying about getting flagged or turning over your money to a shady betting site. To kick things off, we believe it’s crucial to catch you up on the current legal status of NFL betting in the United States and handoff our list of recommended legal betting sites that we’ve reviewed. Then, the only thing you have to worry about is how you’re going to celebrate after you score a winning bet. Is It Legal To Bet On NFL Games In The United States? Yes, it is absolutely legal to place bets on NFL games, teams, players and events as long as those bets are placed through a legally licensed and regulated sportsbook. Legally sanctioned betting destinations can be found through licensed sportsbooks and casinos located within one of the states that have legalized sports gambling post-PASPA, a state-regulated online sportsbook, or through legitimate offshore sportsbooks operating legally within the industry such as the ones listed in this guide. Thanks to the SCOTUS repeal of the Professional and Amateur Sports Protection Act, there are no longer any US federal laws prohibiting state based sportsbook gambling. Betting on sports through offshore sportsbooks has never been illegal through federal gambling laws. Both Washington state and Connecticut prohibit all forms of betting online regardless of the source. All of the sportsbooks we list on our NFL page are in fact 5 star sites boasting years of experience in the sports betting industry. However one particular site "Bovada" rises above the competition and are the go-to #1 NFL betting site for thousands of players located in the United States. Here are a few reasons why players love betting at Bovada. For starters they are legally licensed which is a must for any of the sites we recommend. They are also part of the Bodog family of gambling sites which is a household name in the sports industry with a perfect track record. New players can partake in a 100% matching bonus up to $500 on their initial deposit, as well as enjoy their world class online casino software all from one master betting account. And when it comes to sports betting, they offer everything under the sun including offering betting lines on every sport imaginable including the NFL. Choose from straight bets, teasers, parlays, prop bets, quarters and half line bets, live in play betting platform, mobile app for betting on the go and a host of other options that make them the top rated online sportsbook. 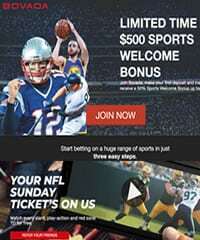 Needless to say, if you are looking for a reputable one stop shop for all your betting needs, Bovada sportsbook is the perfect choice. These are the top rated sportsbooks to be on NFL games for the upcoming 2019 season. Each is licensed and regulated by an offshore commission that governs sports betting. Which Laws Affect Betting On NFL Games In The US? The two main laws governing sports betting in the US include the Federal Wire Act, and the Unlawful Internet Gaming Enforcement Act (UIGEA). In addition, a few states such as Maryland and Washington have enacted laws to regulate sports betting recently. The Federal Wire Act came into effect in 1961 when sports fans used the phone to place bets on games. The aim of this act was to outlaw bookmakers operating outside the state of Nevada. At the time, the Internet did not exist meaning the creators of the Wire Act may not have envisioned or foreseen the technological changes that would revolutionize communication a few decades later. In fact, the US Department of Justice has said that the Wire Act does not apply to online poker rooms and other online sports betting sites. Although the Wire Act has never been used to pursue sports bettors, it has been used to prosecute several gambling site owners. In 1961, the then Chairman of the House Judiciary Committee, Emanuel Celler, warned while delivering his contribution to the debate on this bill that it only targets bookmakers or gamblers who place bets on behalf of others. It does not focus on the casual gambler. The Federal district court of Rhode Island concurred with this view during the United States v. Baborian case when it said that Congress "did not intend to include social bettors within the umbrella of the statute, even those bettors that bet large sums of money and show a certain degree of sophistication." At this point, it is worth noting that the Wire Act is not a standalone legal framework. It complements various anti-racketeering statutes such as the Illegal Gambling Business Act, Travel Act and the Interstate Transportation of Wagering Paraphernalia Act. It is important to understand this aspect because it underpins the legality of sports betting via offshore bookmakers. The Unlawful Internet Gaming Enforcement Act of 2006, on its part, does not expressly ban online sports betting in the US. Instead, it simply bars US financial institutions from processing payments related to gambling sites. While the UIGEA did make online sports betting difficult, it did not stamp out the practice completely. It is easy to circumvent this legal hurdle by using financial institutions that have no connection with US banks. Alternatively, you can use pre-paid cards to avoid leaving a digital trail. The last major legal framework related to sports betting is the Professional Amature Sports Protection Act (PASPA). PASPA was repealed in 2018 but before the repeal, PASPA banned domestic sports betting in 46 of 50 states. Only Nevada, Montana, Oregon, and Delaware were exempt from the PASPA law. Since PASPA's repeal, states have been allowed to enact domestic sports betting laws. Several states have already enacted laws and started accepting bets and many more are expected to follow in the coming years. Betting on NFL legally does not mean, however, that each Internet sportsbook offers a reliable experience. A thorough review process should still be undertaken before you open an account at any online sports betting portal. Whether betting on football in the U.S.A., the UK or some other country, you will find that different casinos offer vastly different NFL betting odds, and it often pays well to hold multiple accounts at competing Internet sportsbooks. This always ensures you can get the most attractive side, number, line or total, giving your Sunday or Monday night wager the best possible chance at winning. Just Bottom Line It For Me. Is NFL Betting Legal Or Not? A lot of players just want a straight up answer as to whether or not it is legal to bet on NFL games. We are not lawyers and recommend all players to consult with an attorney for a legal answer. Especially if you are a USA player as the laws do in fact vary from state to state. As a whole our feeling is that there is nothing illegal about betting with an offshore sportsbook with the exception of Washington State. However, because online gambling is slowly becoming legal in the United States, the laws are constantly changing. So again we really encourage all players to consult with an attorney. We can say with 100% confidence that every one of legal US online betting sites that we endorse are in fact legally licensed and regulated in their respective jurisdictions. Each of them has been vetted by our team of professionals to ensure they employ advanced security protocols, are licensed and compliance certified, utilize an industry leading, reliable software platform, and provide an overall high-quality sports betting experience. Learn more about accessing the industry's leading online sports betting brands in our section covering online sportsbook reviews. What Are The Benefits Of Betting Offshore? Many people want to know if there are any benefits with betting offshore compared to your local bookie. Offshore sports betting has several advantages. Firstly, most offshore bookies offer great bonuses. Furthermore, offshore betting sites tend to offer larger bonuses due to economies of scale and low overheads. Such offers may include reload bonus, signup bonus, and referral bonus. Secondly, you would be able to enjoy sports betting without breaking the law. As mentioned earlier, the US sports betting laws do not prohibit the use of offshore bookies, meaning you do not have to worry about the feds knocking on your door. Thirdly, offshore betting operations generally better odds compared to US-based bookies because they are domiciled in countries that do not subject them to heavy tax burdens and they can pass this benefit down to their clients in the form of better odds. Finally, offshore betting sites offer wide range of wagering options. Do These Sites Offer Mobile Betting Options? Online gambling in general is currently moving to the mobile format in a big way. Our favorite computers are making the transition from the desktop to the pocket or purse, in the form of smartphones and tablets. If you are an NFL betting fanatic like we are, you are anxious to place your first bet of the 2018 season. Just remember any potential Internet sportsbook should still undergo an extensive review process either by our team of professionals or yourself before you deposit your hard-earned money and start surfing the NFL betting odds. Each of our featured legal US betting sites has gone through this review process. Here are the opening odds to win Super Bowl 54 in 2020 at Bovada. Money line wager involves placing a bet on the team that you believe will win a game. Moreover, money line wagers have no spreads. The upside to this type bet is a winning bet on an underdog translates to a higher payout. The downside is money line wagers require one to risk more money. Money line odds usually have a plus (+) or a minus (-) sign preceding them. Odds with plus signs denote underdogs, whereas those with minus signs denote favorites. To understand how money line wagers work, consider a hypothetical game between the Colts (+350) and Bengals (-380). In this case, bookmakers favor the Bengals to win. To even out the betting field and avoid running loss-making businesses, bookmakers make bettors wager more on favorites and less on underdogs. This means you would have to bet $380 to win $100 if you pick the Bengals. On the other hand, every $100 wagered on the Colts would translate to $350. Spread betting is the most popular type of NFL bet. Bookmakers list favorites to win games using odds preceded by a minus sign, whereas the odds for the underdogs are preceded by a plus sign. In cases where there is no clear favorite/underdog, bookmakers list both teams as "Even" or "Pick". This is in addition to the "point spread" (PS) for each team. Depending on a team's perceived likelihood of winning/losing a game, PS can range from double to low single digits. With this in mind, assume the Buccaneers (+7.5) are up against the Texans (-7.5). The expectation is that the Texans would trounce the Buccaneers by 7.5 points. The Buccaneers would have to win by eight points or more in order for bookmakers to pay bettors who wagered on the underdog. To cash out a winning favorite bet, the Texans cannot afford to lose by more than eight points. In other words, they would have to lose by less than eight points, tie the game, or win. The over/under bet, which is also known as totals, entails predicting the total number of points that both teams are likely to score. This betting line is relatively easy to understand because all you have to do is predict whether the final score between two NFL teams will be over or under the bookmaker's figure. For instance, consider a case where the New York Giants are playing the Detroit Lions and a bookmaker has listed a total score of 45. Bet under if you expect the final score to be less than 45 points and vice versa. A push is an outcome that results in a tie between a bookmaker and a bettor. To avoid such outcomes, most bookmakers add 0.5 (half point) to the spreads or point totals they publish. The industry name for this half point is "hook" and its aim is to maintain betting house advantage over bettors. A parlay refers to a situation where a bettor selects and groups two or more wagers to increase the potential payout. However, all wagers grouped together must win in order to receive a parlay payout. The good news is you can group together different types of NFL bets to increase the amount of potential winnings. A teaser, on the other hand, is in many ways similar to a parlay. The only difference is teasers allow bettors to buy and add extra points to the point spreads or totals given by bookmakers. Once again, you can select and group more than two teasers to increase potential winnings. Placing a wager on professional football requires a bettor to seriously crunch the numbers to determine a winner due to the parity among teams in the league with the expression “any given Sunday” being a common phrase, meaning on any given Sunday, any team can beat any other team. However, if you can find value on NFL games and research matchups to beat the odds, then your path toward profit could begin on any given Sunday. To improve your chances of placing winning bets, you must develop and use credible betting strategies. Such a strategy would catapult you into the rare category of professional NFL bettors who deploy sophisticated betting strategies that include variables such as free agency prospects, injuries, home team advantage, overall team strengths, winning/losing streaks, and overall team weaknesses. After carefully evaluating these factors and comparing results with bookmaker's odds, seasoned punters can determine more precisely odds of picking winning bets. One of the most misunderstood, but important aspect in NFL betting, is financial discipline, which largely entails planning your bets in advance and more importantly, sticking to your plan. Jimmy Vaccaro, an influential Las Vegas bookmaker, recommends betting no more than $50 a game. If you do not fancy strait-jacket-style money management, Morey "Doc" Moseman, a professional gambler, recommends betting no more than you can afford to lose. Contrarian betting is similar to the stock market investment strategy that goes by the same name. By adopting this strategy, you would place bets that defy conventional wisdom. Nevertheless, only do so after carefully evaluating other factors like an NFL team's strengths and weaknesses. Do not place bets when under the influence of alcohol, at least big bets. If you are just putting a few bucks on an NFL game to have something to sweat, that's one thing. But if you are betting big money, it's really not wise to bet under the influence. Yea it's fun, but it can bust you real quick if you aren't careful. Before betting on any sporting event or game, consider the prevailing public opinion. You may come across new game-changing information that you had missed/overlooked earlier. No complete original film exists of the first Super Bowl that took place in 1967 between the Green Bay Packers and the Kansas City Chiefs. Legend has it the broadcasters, NBC and CBS, taped soap opera content over the film of Super Bowl I. In 2016 experts were able to recover films of individual plays from multiple cameras and combine them to recreate the game. In an age when star players earn millions of dollars in salary per year, the most coveted trophy in the sport is worth only $25,000. Corporate sponsors get the lion's share (80%) of Super Bowl tickets. Jack Shapiro played for the Staten Island Stapletons in 1929, despite weighing 119 pounds and standing 5' 1" tall. Contrary to popular belief, footballs are made from cowhide, not pigskin. When it comes to online wagering, offshore betting operations generally offer more in terms of larger bonuses, mobile and live betting options, better odds and a wide range of wagering options. I don't know of any sportsbook in Vegas that will match your bankroll as soon as you walk in the door. Even the guru handicappers who live in Vegas bet offshore because of the benefits it offers. And the fact that there is nothing illegal about betting on NFL games through an offshore bookie makes it a no brainer for players living in the United States. If you are wanting to get a jump on what is going to be happening in the 2018-2019 NFL season, you can find some great information on the NFL official website. You can also check out NFL's stance on betting online, it's a really interesting read. USA MLB Betting Sites: Get the most current information on industry-leading sportsbooks covering MLB betting lines and offering a sophisticated security profile, legitimate licensing and certification profile, and an overall high-quality online sports betting experience. US NBA Betting Sites: Obtain helpful information that introduces you to the safest and most trusted online sports betting brands that feature NBA betting lines and a wide range of wagering options, all within a safe and secure gaming environment. USA Horse Betting Sites: Enjoy learning more about the horse betting industry and how to get involved by accessing the industry's most trusted and secure options. Our team has vetted several reputable brands for inclusion in our guide. For players who enjoy a variety of online gambling venues, feel free to visit our pages dedicated to legal USA poker sites and USA legal casinos.